Your cosplay just got a whole lot better! 23-inch diameter shield based on Hero's Edge! Features a comfortable built-in armband on the back. With this polypropylene shield from Hero's Edge, your cosplay just got a whole lot better! 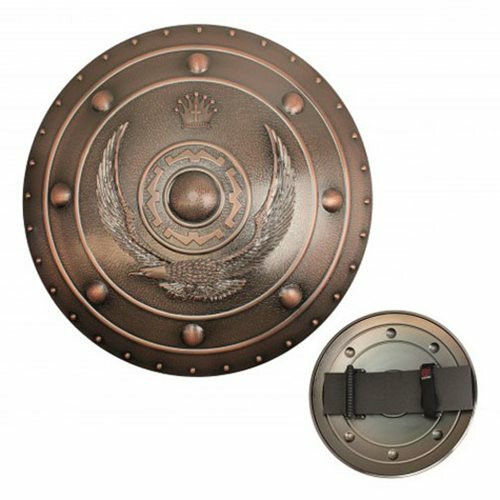 The Hero's Edge Bronze Kingdom Polypropylene Shield is made with indestructible technology, and there's a comfortable built-in armband on the back so you don't have trouble holding onto it. This awesome item measures 23-inches tall x 23-inches wide x 5-inch thick. It's a must for cosplay, roleplay, and anime fans!